Holy yum! This pizza is going straight to the top of my game day menu! Looks amazing! Kale is the best on pizza. Well, so is arugula. And whipped any kind of cheese! This looks so fab. This looks absolutely heavenly, I love pizza sans the tomato sauce! Do you think this would work with spinach as well? Kale is kind of hard to come by where I live but this recipe absolutely makes me drool! Everything about this is magical. Kale on pizza? That means I can eat the whole pie right? And whipped ricotta?! I am obsessed with it, but have only have it in a dessert. Life is forever changed. Pinned! Whipped ricotta is officially my new favorite condiment! Gah I could eat this for breakfast right about now! I even do this with arugula and add a little hot Capicola. Is this dough, bready or chewy? I am obsessed with your whipped feta once I finally tried it after seeing you use it so often. Back in December I had some leftover ricotta from lasagna making and decided to channel you and whip it to top some pasta. It was delicious :) My money is that it is delicious on pizza as well! I loooove kale on pizza. i am making this fo sho. This is about to become my favorite pizza too! Whoa nelly…amazing! Now that, is a pizza recipe I can stand behind — and devour. Yessss. YESSSSS i want this with all of my soul. Amazing, Jessica!! I can’t even! This is INSANE! I need it right now. People need to invent computers you can lean into and grab stuff, because I would take this whole pizza. When you said the kale gets crispy that just totally sold me right there. You really hit the nail on the head here. Vegetables are best when they include pizza! Kale is the best on pizza. I’m so excited to try this recipe. So delicious! So inspirational! Thinking about eating this pizza makes my palms sweaty and I think I’m a little bit of breath. Is this what true love feels like? So so perfect, I can’t even handle it! GENIUS! I’ve still yet to try your garlic chili paste, but I’m super tempted now! MARINATED kale? Wish I knew about that sooner in life! That’s fabulous! I don’t even like kale, but this sounds amazing! OMG!! You may have just reinvented the white pizza we all know and love. I’m totally obsessed with this pizza… I mean SO much flavor!!! And red sauce + toppings IS for cool people, I of which am not one either. :) White pizza for the win!!! This looks so delicious! Where did you get your pizza stone? Try using only 1/2 tsp yeast and letting it rsise 6 hours. Then bake hot about 550 on pizza stone. Tuscan Grandma gave me that tip. It develops a slightly different flavor and crisp texture with the slow rise. My kids just love it. It’s what dreams are made of. My dreams. Well, that and high-waisted pants. I haven’t had white pizza in so long but this definitely has me swooning. Love the fresh kale mixed in and dressed in garlic? Yes, please! 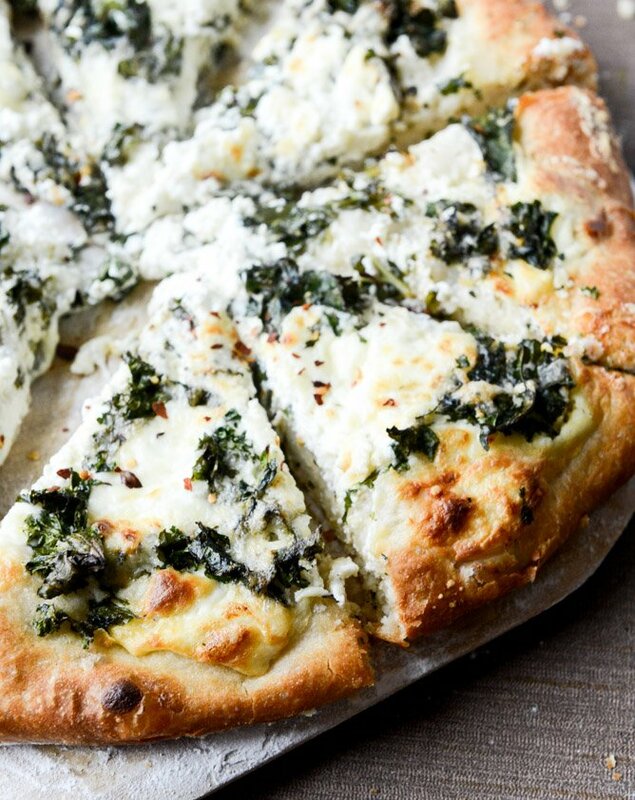 This pizza with whipped feta…I think I would DIE. Ugh. Everything I make of yours is phenomenal. I cannot wait to try this recipe! I love pizza. And Kale. Together = wonderful. Yummy pizza toppings…try artichoke hearts & onion. Perfect combo. We order it EVERYTIME we get pizza at Bella Notte in the Strip. YUM!!! Do you make the chili garlic paste or buy it somewhere pre-made? Pizza topping heaven! I adore the whipped feta and actually added ricotta to it when I last made it…so this is right up my alley. Yum! Made this tonight. Added bacon. The hubs kept saying “wow this is good”. This is a winner for sure! This is my favorite pizza with kale instead of spinach. I cannot wait to try this. I love white pizzas with greens. This pizza looks beautiful and i am dreaming about the crunch the kale adds. YAY for greens! I actually just made white broccoli pizza last weekend and it was the BOMB. Both broccoli and kale with ricotta make an awesome combo!